a partner dance, involving a “leader” and “follower”, and danced to great music. Unlike other Latin dances, Brazilian Zouk can be danced to radio-friendly tunes, such as Pop, R&B and Hip-Hop, Trap and Chillstep songs, and even songs without percussion instruments. Kizomba or Zouk ghetto music from Angola and Brazil are also frequently used. Brazilian Zouk evolved from Lambada, and was developed in the mid 1990s, after interest in Lambada declined. It is a newer dance, as compared to Salsa, Bachata and Kizomba, but it is rapidly gaining tremendous popularity all over the world. This is partly due to the use of popular and current music in the dance. To learn more about the history of Brazilian Zouk, click here. Check out what Brazilian Zouk looks like! Because it makes you happy. Because it provides stress release. Because it allows you to connect with other individuals, while moving to your favorite tunes! For those of us who dance Brazilian Zouk, we know that it is a dance where magical moments are created with another person. It is a dance that allows for trust and connection between partners. With that, you can free your mind, express yourself, and share in a conversation of movement to music, with a complete stranger. Anyone can learn to dance Brazilian Zouk. All it takes is interest in the dance, love for the music, and a passion for connecting with other like-minded individuals! In addition to experiencing the joy of dance, you will also experience health benefits, in the form of improved strength and balance, better posture and coordination, increased confidence and an overall sense of achievement. The learning process will challenge you, but also give you many rewarding experiences. So, if you’ve got the passion, we’ve got the patience. Come and experience the gift of Zouk for yourself. Zouk Dance Academy is dedicated to providing quality instruction in Brazilian Zouk, so as to create Brazilian Zouk dancers that are respectful of others, safe and fun to dance with. In addition to investing in continuous education through private lessons, we organize Brazilian Zouk events in Singapore, featuring workshops and parties with the very best professionals in Brazilian Zouk. Because the dance of Zouk is dynamic, dancers must have a good connection to each other, to be able to move as one. The synchronicity of movement is also what makes Brazilian Zouk so fun! At Zouk Dance Academy, we believe in experiential and consequential learning – where students learn about the dance through fun exercises with their partners, and structured, physical drills. Instead of rote learning, students learn, very quickly, how to lead/follow by experiencing the natural consequences of their actions in a playful manner. Lessons include games, exercises and drills that focus on improving balance, strength and control. As a result, we often see students exhibiting greater confidence in all areas of life, and a greater sense of well-being. We invite you to join us on this amazing journey, and experience the transformation for yourself. To be able to express music in a shared movement – that is truly one of the most magical experiences that Brazilian Zouk offers. Jean Goh is the pioneer of the Brazilian Zouk scene in Singapore. She has been providing instruction in Brazilian Zouk since 2008, and is lauded by internationally renowned Zouk artistes for creating dancers that are strong in their fundamentals and delightful to dance with. She has an M.S. in Applied Educational Psychology and C.A.G.S. in School Psychology. Having invested much time (and money) in private lessons with some of the world’s most respected and popular Zouk instructors, Jean’s dance style (as a leader) is based on strong foundations in Brazilian Zouk (as created by Renata Peçanha), a blend of traditional and present-day moves, and most notably, a wide array of creative body manipulation techniques. She is particularly accomplished at expressing the music through manipulation of her partner’s body movements. After rigorous training with China SoulZouk, she has also been initiated into the SoulZouk family. SoulZouk is a dance philosophy that emphasizes the pleasure and comfort of the dancers, and connection with one’s partner through awareness of one’s own body mechanics and that of their partner’s. It celebrates the “beautiful chaos” of social dancing and everything that it brings – connection, creativity, musicality, fun, inpisration, interpretation, and so much more. SoulZouk is not a dance style; instead it accepts and celebrates diversity of styles. SoulZouk practitioners are bound not by their style or moves, but by the SoulZouk methodology and philosophy. SoulZouk dancers are known for the feelings of pleasure and comfort that they give to their dance partner, with every dance. Jean Goh is proficient in both leading and following in Brazilian Zouk and other Latin street dances. She has been partner dancing since 2001, when she was first introduced to Cuban Salsa, Bachata and Merengue in the U.S. 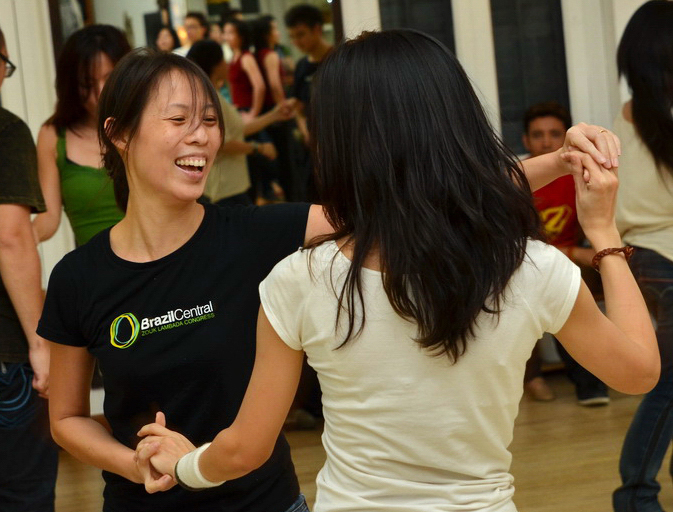 When she returned to Singapore, she started learning LA-style Salsa and Cha Cha. In 2003, she set up the Two Left Feet dance school with her dance partner, where they taught various Latin street dances. It was in 2008 when she first came across Brazilian Zouk, at the Malaysia Salsa Festival. Mesmerized by the dance, she invited Brazilian Zouk professional Alisson Sandi Rodrigues, to Singapore, to train her (as a leader) and her partner (as a follower) in Brazilian Zouk. She started offering Brazilian Zouk classes soon after, and continued to receive training, through numerous private lessons and workshops Zouk congresses. She also spent two weeks in Brazil (Rio de Janeiro and São Paulo) to seek further training in Zouk from respected Zouk professionals.